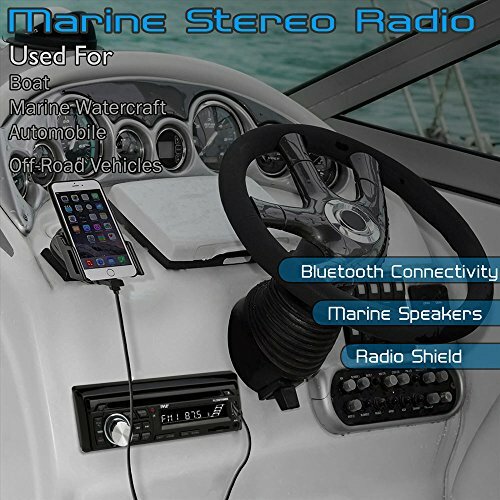 Be it the Bluetooth receiver pairing feature or the AM/FM radio capability with 30 station memory, the Pyle Bluetooth Marine Audio Stereo Kit will grab the attention of many boaters. The attached water-resistant radio shield face will keep splashing or rain water out of your stereo. This ensures that all the internal and external parts of your radio are protected. That’s not all. Attached to this high performance waterproof stereo, is a radio receiver and four waterproof speakers. In addition to that it comes with a matching accessory kit. This combination is sure to give you good sound clarity at all volume levels and provide the ultimate experience for one’s water and outdoor entertainment at a very reasonable price. This marine stereo unit is a one of the least expensive ones currently available and it is the perfect choice for the budget conscious boater; audiophiles will probably want to look into a different system with better quality and more features. What’s an entertainment unit without a good receiver? Marched with an amplifier, its 40 X 50 Watt output power makes it perfect for powering each unit. This highly advanced technology system has excellent functions. 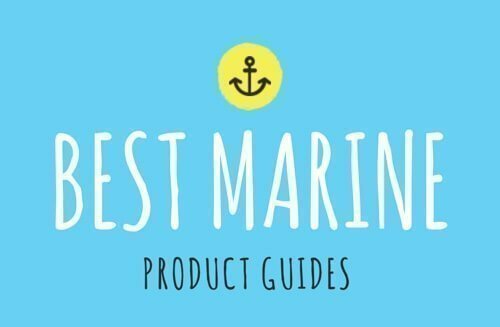 These allow you to connect more speakers to this waterproof marine radio. This applies whether one is in need of bass heavy music or simply wants to listen the latest news broadcast. When party mode sets in, pump up the music and turn the volume to 11. The four 6.5” speakers produce quality sound. The built in equalizer allows you to change among several profiles to select the best one for the music you are enjoying. With a balanced tone quality, its polypropylene cone and cloth surround these speakers make it easy to enjoy an afternoon on the water with your favorite tunes. You won’t miss a beat with these speakers! 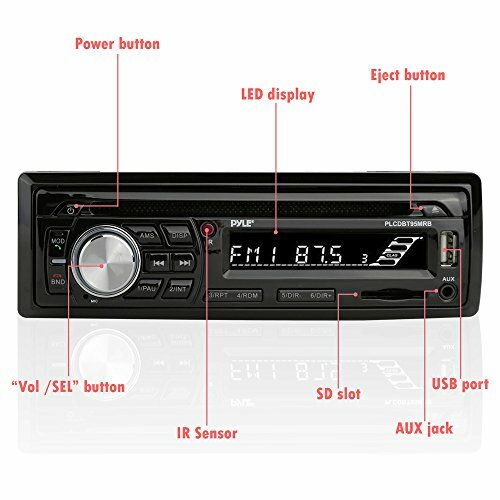 Add the Bluetooth receiver capability and 150 Watts of speaker power and you have a stereo experience out of this world. Multiple media devices (iPhone, Androids, Smartphones, iPad, Tablets) can be connected with Bluetooth technology allowing anyone on board to stream their favorite tunes through the stereo system. The wireless range of 16’ft is will work almost no matter where you are located on the boat. One can easily start the Bluetooth pairing process on your marine radio system. The Bluetooth feature also operates with low power. This in return translates into minimal power withdrawal from your phone or smart device and will not affect your phone’s performance. The built in AM/FM tuner allows you to listen to traditional terrestrial radio for those days when you might want to jam out to your favorite classic rock station or enjoy the early morning radio shows from your radio personality. With equipped USB and SD reader ports, it is possible to play the music or any other audio information that’s stored in any device. One can use the USB port to access music from their phone, MP3 player or SD card. This amazing option also allows the user to charge their phone or power any accessory device that is connected. This is another great way for people to consume their music; even though CD's are almost a thing of the past. Break out your summer jame CD and bring back some great memories on the water. Make and receive calls without the worry of water damage. Not only is it safe but also convenient. The Pyle stereo Bluetooth capability allows one to pair their phone to the enabled stereo. This then ensures that their phone has much less chance of falling into the water. One will be able to carry on an entire conversation without the need to hold their phone to their ear while on the boat. The display screen is sharp and crisp allowing you to see everything you need to quickly. At a single glance, it is possible to see all the information one needs from incoming calls to music options and more. With the wireless remote, one will not have to worry about going to the middle of the boat to control the stereo. This is because the wireless remote control can provide you with an extended range of control over the stereo system. Thankfully this stereo comes with a waterproof cover. This is what provides full protection for the marine radio and other electronics from water and moisture. The cover is highly durable as it is crafted out of high quality marine material. Another easiest way to play music from the stereo is by use of the AUX input jack. This will allow the input of sound from any media device, be it music, audio books or podcasts on the boat. That’s not all; you can also transfer audio from navigation apps or phone calls. With the water-resistant radio shield and the marine grade waterproof construction, water conditions don’t have to impede one’s choice of entertainment. 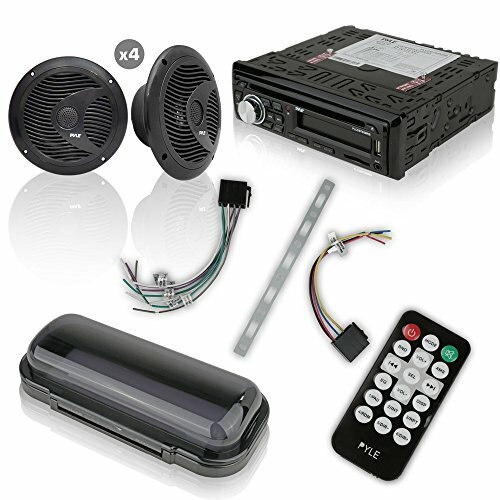 The Pyle Marine Audio Stereo Kit is a good budget stereo system that is great for smaller boats or those looking to stick to a small budget but will probably fall short for audio enthusiasts who want higher quality sound and more features.